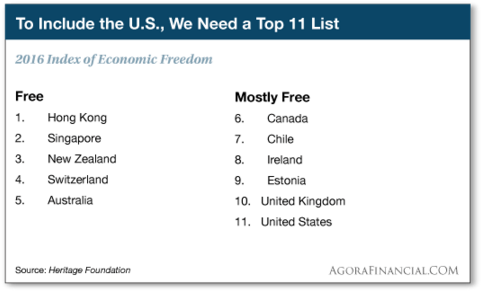 It’s come to this: Great Britain has more economic freedom than the United States. So says the conservative Heritage Foundation, which is out this week with its annual Index of Economic Freedom. The index is a composite of four categories — rule of law, limited government, “regulatory efficiency” and open markets. The index for the United States has slipped eight of the last nine years. Out of all the world’s countries, Uncle Sam ranked fourth as recently as 2007. Now it’s No. 11… and the mother country just vaulted over us. The United States does make the top 10 — barely — in another new survey that looks through the prism from through the angle of innovation. Two Nordic countries come out on top — Finland and Sweden. Britain once again outshines the United States, clocking in at No. 3. The Land of the Free? Only No. 10. “This is due to the U.S. government’s relative underinvestment in R&D as a share of the country’s GDP, weak innovation-incenting tax policies as well as a middling performance in human capital,” writes Mr. Ezell. The word “innovation” brings to mind a theme we’ve touched on here in The 5 from time to time — the urgent, pressing need for more startups. 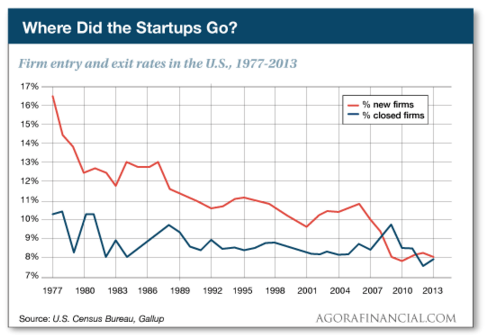 “Without startups, net job creation for the American economy would be negative in all but a handful of years” since 1980, according to a 2011 study by the Kauffman Foundation. You want new jobs? 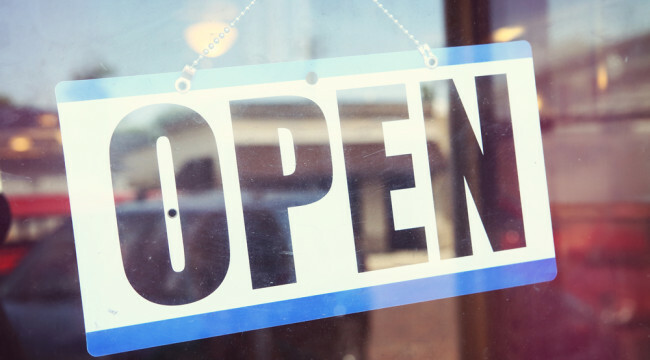 The chatter about small businesses as the “job creators” is only partly true. It’s not small businesses that create jobs as much as new businesses — businesses less than five years old. Which brings us to one more survey. This one isn’t new, but it’s perhaps the most enlightening. Each fall, the World Bank does a ranking of all the countries in the world based on how easy it is to start a business. The United States clocks in at No. 49! New Zealand is No. 1, followed by Macedonia (who knew?) and Canada. Great Britain, you ask? No. 17. Hell, it’s marginally easier to start a business in Russia, which is No. 41, than in the U.S.
We suspect, however, there’s an even bigger impediment to starting a business in the United States than red tape. It clicked suddenly when your editor read a book review over the holidays. The title and the author don’t matter for our purposes today. (It has “Runaway Capitalism” in the subtitle — oy.) What matters is that the author was laid off from a full-time job and went freelance. Suddenly, he was paying massive health care premiums and payroll taxes. The people who are still lucky enough to have jobs that issue them a W2 form every January are clinging to those jobs for dear life. They might want to launch a business of their own… but they’re petrified to make the leap because of health care costs and the self-employment tax. Even before Obamacare, buying health insurance was an expensive nightmare if you weren’t a W2 employee. Research by the Commonwealth Fund finds on average, premiums in the individual market grew 9.9% in 2008… 10.8% in 2009… and 11.7% in 2010. And what did you get for those premiums? Insurers would rescind policies for beneficiaries who got sick. Insurers would refuse to pay for services beneficiaries assumed were covered. And without a human-resource person at their employer to go to bat for them, they were SOL. Obamacare merely took something that was “problematic” and made it “nigh impossible.” You might remember in late 2013 when millions of Americans received cancellation notices for their individual health plans. Those lucky enough to retain their policies saw average increases of 39%, according to eHealth — with deductibles going through the roof. And then there’s the self-employment tax — which skyrocketed during the 1980s just as the number of new businesses began its decline. During most of the 1970s, total Social Security and Medicare taxes for the self-employed held steady around 8.0%. By 1990, they swelled to 15.3%, where they remain today. If you have to meet a payroll, you know the 6.2% “employer portion” of Social Security is an accounting fiction. When drawing up a budget, you include that as part of your W2 employees’ overall compensation. Naturally, the employee doesn’t see it that way… which leads to a rude surprise when that employee starts thinking about striking out on his own. Suddenly, he’s responsible for the “employer portion” and realizes he needs to generate another 6.2% of gross income the first year… just to stay even! We humbly submit: You solve these two problems — payroll taxes and health care costs — and you solve the problem of innovation, startups and new jobs. Solve those two problems… remove the two biggest barriers to self-employment and entrepreneurship… and you unleash an era of unprecedented wealth creation and improved standards of living. We might get the flying car we’ve been promised all this time. We daresay this new era of prosperity would come about even if income tax rates were untouched, current financial and environmental regulations stayed on the books, the Keystone XL pipeline remained unbuilt and litigation reform didn’t pass Congress — you know, the usual Heritage Foundation/Chamber of Commerce talking points. Unfortunately, there are entrenched interests whose oxen would be gored if these two problems were solved. As we learned from the “zombie budget” passed last fall, Congress and the White House are already resorting to chewing gum and baling wire to hold Social Security’s finances together. And health care? The insurance companies and Big Pharma are among Obamacare’s biggest beneficiaries — as intended. The Senate aide who wrote most of the bill was previously a VP at the insurer WellPoint. After her work was done, she went through the revolving door to Johnson & Johnson. Grim as it sounds, there are no solutions in sight to either problem — short of systemic collapse. Who knows, maybe that’s in store. David Stockman, the former White House budget director and one of our newest editors, says Social Security will start paying out more than it takes in by 2026 — years earlier than the official projections. And even if Social Security can be “fixed,” we explained last summer how something is bound to break in the health care system during the next 20 years; otherwise, health care will consume half the federal budget.